Cherry Good is a refreshing and fruity drink made from Montmorency cherry Juice. There is also Cherry Good Light which has only 32 calories per serving and Cherry Good Select which has a higher percentage of Montmorency Cherry juice than the original. Their cherries are grown along the shores of Lake Michigan in North America, where the lake plays a crucial role in preventing temperatures from getting too cold in the autumn and too hot in the summer. Just like vineyards, Montmorency cherry orchards require the right combination of weather and rich soil, to provide ideal fruit-growing conditions, and many people think that the best fruit in the world is grown there. Cherry Good recently interviewed Tamzin Outhwaite to ask for her advice to busy working mums. I’m about to begin filming a new series of New Tricks as well as rehearsing for a new play called Di and Viv and Rose, which opens in the West End in January. It will be the busiest I have ever been, so I’m about to start a fitness regime to ensure I’m on top form! It must be difficult when filming to juggle work and family life. What advice do you have for busy working mums? My advice would be to not feel guilty; we all know we’re working hard for our kids as well as for ourselves. It’s important to enjoy the time you have with them as it’s very precious. For instance, when I have time off I will hang out with the kids and make sure we do lots of different things. I also really treasure our time together in the mornings before they head off to school. I don’t worry about what everybody says as much. I just do what’s right for my body, so I don’t run as much as I did as I find it can affect my knees. I do much more yoga now (particularly hot yoga) and it feels like it works better for my body. My body has changed a lot over the years and I have been all different shapes and sizes. I was probably in the best shape ever on my 40th birthday! I try extremely hard to make sure we have good, healthy food in the house and marry up what they both like without having too much sugar. My fridge is quite healthy so I do allow a Friday treat because if it’s once a week it doesn’t feel so bad. When I grew up we didn’t have sweets, crisps or chocolate as they simply weren’t in the house- my lunch box was the one with the peeled carrots and cucumbers! Don’t give yourself a hard time; we can all get very stressed as a new mum and I think when we stress ourselves out, our kids can pick up on it. Try and let it happen naturally, but if you have good food in the fridge and not too much rubbish around the house then it helps a lot. My kids wake at 6am and that’s always a really lovely time with them. Often, I will put on some music and the three of us will dance around the kitchen as they really love music and dancing. Then we will have some porridge and Cherry Good juice for breakfast. I like Cherry Good Light but the kids will have Cherry Good Original as it’s a little sweeter. My mum is very good at eating non-processed, fresh food. She also juices her vegetables, which I think is a lovely thing to do and she eats a lot of pulses. My mum also avoids eating white bread, white pasta or white rice. She’s extremely healthy and almost completely organic so I try and follow her example and adapt it to fit in with my lifestyle. Very sensible advice, as I’m sure you’ll agree. 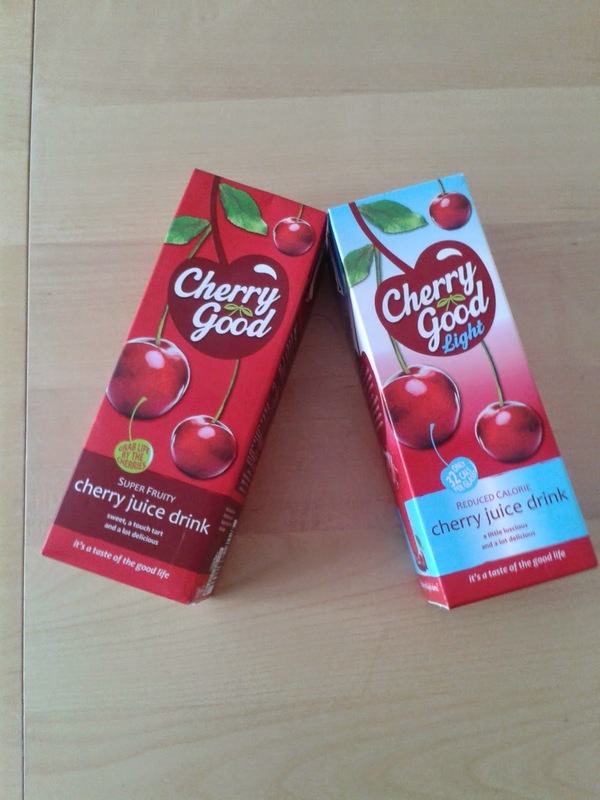 So what did we think of Cherry Good drink? It’s a really refreshing, if slightly tangy juice drink which makes a great change from some of the overly sweet fruit juices out there. And definitely a more exciting non-alcoholic option for an after hours drink. You can follow Cherry Good on Twitter @CherryGoodJuice or visit their website at www.cherrygood.com. *Samples were sent for the purposes of this review. I'm not really much of a juice person, but I know my boyf would love this. He's a big cherry fan. I'm a big Tamzin Outhwaite fan – did you get to meet her, or was it an email interview? good advice about cherishing the time you have with them – i find the time before nursery a bit of a whirlwind all trying to get ready but wish i could turn that into some quality time.